You can save some serious weight by investing in an ultralight windproof and water-resistant shell jacket and ditching your heavy-duty (or even lightweight) fully waterproof jacket. Some of the lightest weight wind shells barely weigh 2 ounces and will easily fit in a pocket, yet offer sufficient protection and warmth for many warm-weather excursions. Here’s a quick review of their pros and cons, plus a round-up of some of the lightest weight wind shells currently available. A 2-ounce water-resistant shell will keep you adequately dry in a light rain or short-lived drizzle—but you’ll definitely get wet in a pouring rain. The ultra-thin fabric on these shells will block all by the most intense winds, but it will also tend to flap noisily—an annoyance if you’re in the wind for prolonged periods. These shells add warmth to your layering system by reducing convective heat loss and helping to trap warm air next to your body, but seldom seal tightly around the wrists, waist, or neck, which reduces their warming effects. Many ultralight shells also lack hoods, further reducing their protection and warmth. But the advantages are enormous. Or perhaps enormously tiny as the case may be. These shells pack down to microscopic size and weigh less than the watch on your wrist. 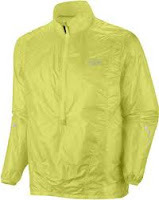 Compared to fully waterproof rain jackets, which can weigh well upwards of a pound (even lightweight versions are seldom less than 12 ounces), an ultralight wind shell offers some significant weight savings. Average weight: 1.89 ounces (size for this weight not specified, though size medium is standard). 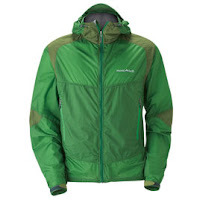 Ultralight 7-denier by 10-denier ripstop nylon fabric. No frills and half-zip shaves this down to the bare minimum. $135. Weight: 2.3 ounces (size medium). 7-denier rip-stop Ballistic Airlight nylon. Features a hood and drawcord for both the hood and waist hem. $99. Average weight: 3.2 ounces. 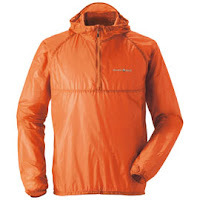 Full-zip jacket of 7-denier nylon features a hood and small chest pocket. $120. Average weight: 4.3 ounces. 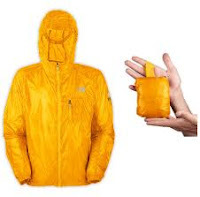 One of the better deals on a wind shell. Features drawcord hem and a small chest pocket. $70. Also available in a hooded version (4.8 ounces, $75).